At last, Gib gets nearer to the love of his life … yes you’ve guessed it … Bramble! It was a wet and dreary Friday yesterday. 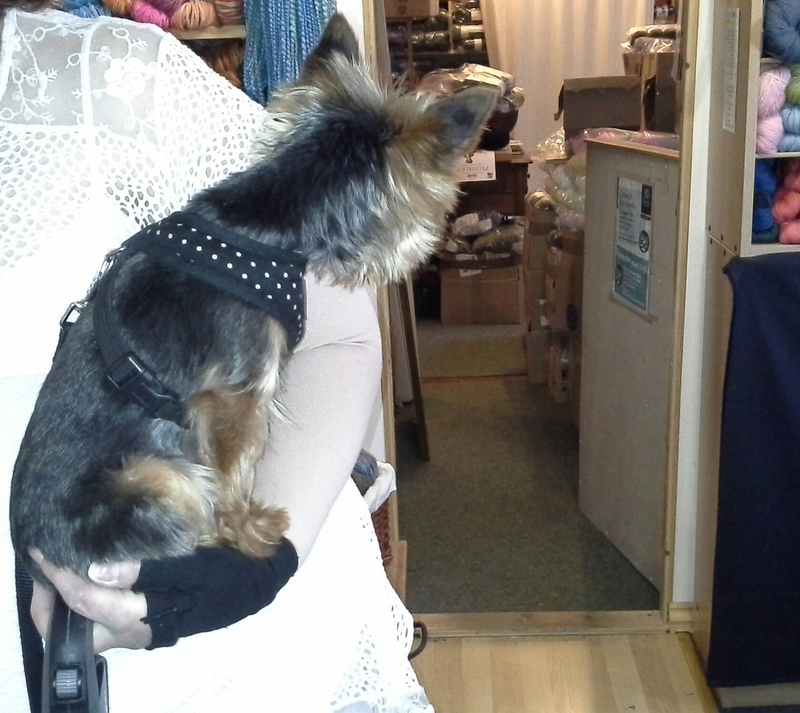 The shop was heaving with holiday makers happily leafing through patterns and wools. In the middle of the crowd in walked Bev with the ever hopeful Gib. Gib is in love. Despite not being the same species he suffers from a long held unrequited love for Bramble. Bramble of course is indifferent to his sad plight (though I have a sneaking suspicion she enjoys the attention). Whenever Gib pays a visit to the wool shop he watches the doorway to the stockroom ears aquiver, every part of him anticipating a glimpse of his ‘one true love’. Invariably Bramble, sensing an alien presence, saunters down from whichever nest in the house she is sleeping in to pose in front of him, look superior, hiss in his general direction and stalk off. Poor poor Gib. To get back to yesterday morning … Gib was in luck. 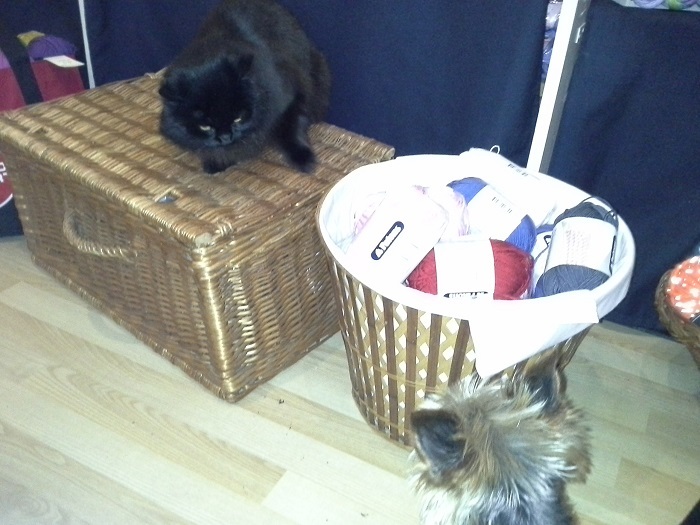 Bramble sauntered into the middle of the shop and sat on the basket above his head. Dear little fellow thought his luck was in until he realised she might just pounce. She didn’t but he retreated, remaining content to peep out from behind Bev’s legs and dream that perhaps if she did swoop down it would be for a kiss. Dream on Gib!